Destiny Beach Villas can be found along the Eastern bank of Four Prong Lake in Crystal Beach FL. The villas sit directly across the street from the sugar white sands of Destin’s finest beach! These fine Destin Vacation rentals have gulf views and access to a large community pool! The beach is just a two minute walk with a tunnel that goes beneath the road so you do not have to cross any roads if you don’t want to! Right by the beach access you’ll find the Crab Trap restaurant and tiki bar offering a plethora of fresh seafood and ice cold libation options! All About The View’s interior is decidedly contemporary and accents the abundant views surrounding the home. The first floor contains the sleeping quarters and features two master suites. Both masters have their own porch and one focuses its attention looking towards the beach, the other is perched looking towards a scenic lake. The second level of this beach-view home is designed for entertaining. The living room and dining room are open and merge together with a long beach facing balcony extending the width of the property. Adjoined to the common area is a generous kitchen with a massive bar. First Floor: King bedroom, full bath, and king bedroom with full bath. Second Floor: Living room, kitchen, dining room, full bath, two balconies facing the Gulf of Mexico and Destiny Lake. Crystal Beach is home to colorful classic-styled beach cottages, intimate condominium buildings, white picket fences, meandering sidewalks and quaint eateries. This community is family-centric and here, the unwinding is easy! But don’t think excitement isn’t on the menu though as this area features the Destin Commons – home to upscale shopping, multiple dining options and venues ideal for entertaining the entire family. Additionally, two of the most highly rated golf courses, Kelly Plantation and Regatta Bay, are just seconds away. 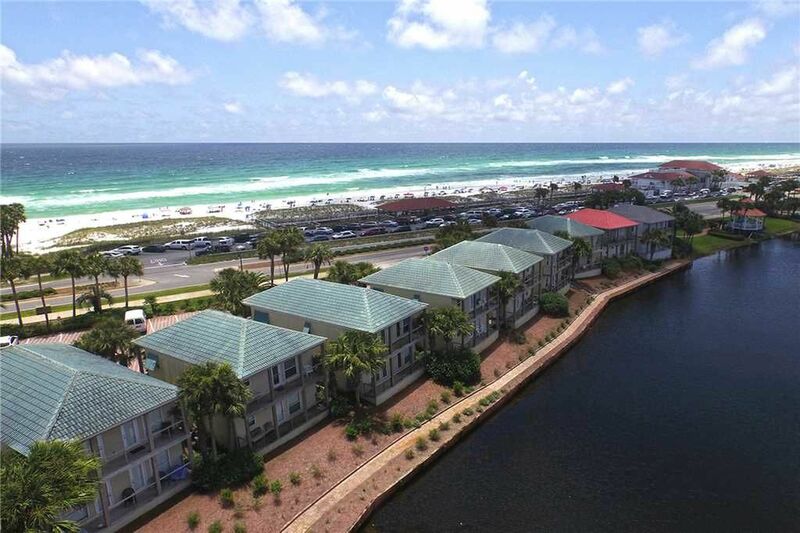 Crystal Beach is a wonderful location due to the fact that it’s directly between Downtown Destin, and Miramar Beach. Head to Downtown Destin to explore Destin’s historic harbor district. You can see all the fresh catches coming from the Gulf, and dine at the locally owned restaurants along the harbor to get a taste of the wonderful seafood Destin is known for. If you head east to Miramar Beach you will find Silver Sands Outlets. Silver Sands is the largest outdoor outlet mall in the country. Perfect spot for the shopper in your group! Also check out Baytowne Wharf for a fun time the whole family can enjoy.